The issue with many SEO companies is they don’t know what they are doing. I get calls daily from people who are still scratching their head wondering what the hell happened with their last SEO company and just what went wrong. They story is always the same; they tell me that they were either recommended this SEO agency by a friend or that they chose this company because they offered to get then to page 1 of Google and it was all backed up by a written guarantee. The issue here is that many SEO companies will say almost anything to get your business and once they have it they will either do absolutely nothing by pretending to do some sort of SEO or the SEO that they do implement is seriously non compliant and old school – hence, horrific rankings. The problem with many SEO companies is that by the time the “results” you’ve paid for have vanished, so has your SEO provider’s budget! In this blog article I will explain to you 4 ways that your current SEO team is demolishing and hindering the growth of your business online, effectively ruining any chance you have of a decent Google ranking and why SEO Sydney Experts is different. If you go back say 5 years to get any sort of rankings all you needed was to buy a mass of back links online and have them point to your site. It was easy to do and really cheap. There were companies that literally had millions of back links all pointing to the home page and they were doing really well on Google. How times have changed. Google has now forbidden this type of out dated practice and will only reward and push authority/trust to your website if there are back links from high authority domains. Anything else and any other types of back links are a pointless and useless exercise. Essentially, a waste of time and money. This massive Google update is common knowledge among all SEO agencies but as account manager of SEO Sydney Experts, Steven Walberg explains: ‘this practice of dodgy, cheap, insane link strategies are still common practice among a serious number of SEO companies in Sydney. They still purchase low authority/ easy to obtain links in order to substantiate the fact that they are doing some type of SEO work and in the process are killing your website is the eyes of Google. Once their algorithm detects all these spammy back links and their attempt to build web authority through blog private networks and spammy directory sites your web presence will suffer heavily through a penalty and if you think your rankings were bad now, just wait till the penalty hits, your site will disappear completely’. As Steven explains; ‘the way in which many SEO companies conduct themselves and their business practices is reprehensible. This is due to the low barriers of entry and the unregulated nature of SEO. Plus if unscrupulous SEO companies are prepared to ignore their conscious and blindly rip businesses off, then the profit margins are huge. This temptation is unfortunately too hard to resist for a good chunk of players. My advice is to keep a close eye on your rankings and if there is no improvement in the first couple of months, hold them to account for this. Also audit your link profile and get them to show you the links they have created. If they look or smell fishy then it’s time to bail and go elsewhere’. My advice and I keep telling potential clients this time and time again, if you start to suspect that an SEO scammer is ripping you off, get immediate help from ‘white hat’ professional SEO team like us – letting things drag out is not a good idea and will only damage your SEO chance even further. Remember these dodgy brother SEO guys are out there to scam as much money as they can off you so be really vigilant all the time. You will soon realise by their level of customer service and they way in which they try to dodge your calls/emails because they are afraid to talk to you. What used to be a good SEO practice by cramming as many words as you can that related to your industry on 1 page is now a huge no no. Sure, you may get a bit of a rise in the rankings but once Google’s content algorithm detects your keyword spamming the results are BAD! Many SEO companies will do this in order to ring you up and say; ‘hey look at us we are doing work on your website, look how many words we have added….we must be good’. Unfortunately so many people still fall for this tactic and it’s a pity. “Keyword stuffing in order to pretend that they are doing some work is another massive way SEO agencies take money for not doing anything, It’s rampant and industry wide which reflects poorly and often tarnishes the reputation of good businesses like ours” says SEO Sydney Experts account manager Steven Walberg. Let me explain further what KEYWORD STUFFING is? Say your business is law firm in Sydney and your aim with engaging an SEO agency is to rank for all keywords that relate to your legal services such as divorce lawyers sydney, conveyancing lawyers sydney or will and estate lawyers sydney. Use those keywords above throughout all of the content on each page of your website. Content would sound ridiculous as you repeat those words over and over again. The first paragraph would go something like this: ‘We are Sydney’s leading divorce lawyers who specialise in divorce law and help people with their divorce’. It sounds bad, reads even worse and Google will eventually see this and penalise these types of pages within your site. Your bad SEO company will not tell you about this till it’s all too late and in the meantime they are taking money from you month after month. When you discover this and it’s all too late, you are out of pocket with a penalised website. OMG…if I could tell you the number of times I have seen this happen. Make sure that all of your service keywords are in white text on a white background, invisible to people but still able to be indexed. Basically, white on white where you can cram as many keywords as you like on 1 page. If this is on your website and it’s been done by your SEO company then it’s time to immediately sack them and tell them to fix this by deleting all this text. On every image in the site use these keywords over and over again even if these keywords are unrelated to the image. In the page titles rather than focus on the message and purpose of the page, they will stuff as many keywords as the can into the title in the hope Google will this page for each keyword in the title. A page title the description of the page and should ONLY be about 1 specific topic not 4 or 5 topics. Tell you to create multiple pages about the same topic so that you have a useless 40-50 page website with each page saying the same thing. This can also prove tricky for pages that are created to capture a whole bunch of suburbs that you do not necessarily work in. For example creating multiple individual suburban pages for your website. This is common practice especially with tradies. It may work now but you are walking on thin ice if you do this for 100’s of suburbs and hope to get away with it. All Google has to do is ban this and change it’s algorithm and these pages will disappear – just a warning that if your SEO agency is implementing this type of keyword stuffing with individual suburbs, this may all come crashing down. The huge issue with out dated SEO tactics like keyword stuffing is that they do have a bit of a sugar hit/spike in the rankings and you can see some results. HOWEVER, Google is onto this and will detect this. Because keyword stuffing results in such a bad user experience and really high bounce rates ( people will land on your site and just exit it), Google’s quality content algorithm in combination with these statistics that they have will penalise your website heavily. A proper SEO agency like ours would make sure that all your content on each page is engaging, informative and immediately addresses the nature of the inquiry by being professionally written by a copywriter. Not slapped together by an amateur in the hope of gaming the system and cheating Google. If you can remember this formula you will be on your way to SEO success: great copy + high quality link strategies = better Google rankings. Because of the competitive nature of SEO, many companies will promise that they will get say 30 keywords on page 1 for you and they will do this free of charge till they do. Or even worse, the will tell you they will back this up with a guarantee. I have written so many article about this so I hope i have hammered the point home but still the majority of businesses searching for an SEO providor will want this worthless, useless written guarantee. They somehow ( and for the life of me I cannot work out why, with all this literature out there as to why you can never guarantee SEO rankings) feel more secure if they have this in their hands. OK, so here’s the scam. 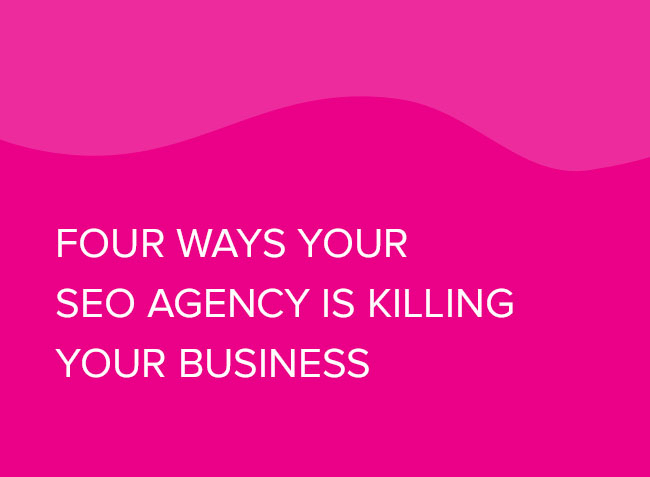 The SEO agency will get your keywords to page 1 but these words are not your core service/product keywords and will have no traffic going to them. It’s a pointless exercise geared strictly towards scamming you. By getting some keywords to page 1 these seo agencies will have full filled their obligation thereby committing you to whatever you signed in order for them to rank you. Essentially they are ranking you for low quality terms with little or no revenue potential. According to Steven; ‘when it comes to Google it’s seriously easy to rank worthless non competitive keywords. Ranking 4 to 5 word phrases is child’s play and so many people fall victim to this pathetic scam. These phrases are not relevant and will have no impact on what your customers are searching for. In fact this may harm your future SEO rankings as people landing on your site will leave it immediately as this is not what they are searching for. Bounce rates go up, average session times for your site go down and along with it your rankings as well. You can have thousands of keywords on page 1 and it will not bring in 1 client or 1 extra cent of revenue if no one is searching for those terms. Remember our lawyers sydney example, what’s the point in ranking ‘ lawyers who work the weekend in St Leonards when no one will ever search for this. 4. It’s all about the content and not the links. So many agencies will tell you that link building is dead and that all you need to do is publish great content. This philosophy is pushed out by SEO companies that have no clue about how to use back links effectively and will use the good money you pay them to get bad content written cheaply in a third world country so they get as much profit as they can. You will think they are doing a stellar job because they are writing content when in fact the copy they write serves no purpose and will do your site harm? Why? Because bad copy will be detected y Google and will kill your rankings as well as irritation your site visitors. SEO fraudulent agencies that rely on content only and ignore the importance and power of back links are killing your website online. So these are the 4 factors that are smashing your chances of having any hope of ranking. If you feel as though your website is not working as well as it should be online then I suggest you take a good long hard look at who is doing your SEO, study the points above and then take immediate steps to stop this causing your more harm. We are here to answer any questions you may have on 02 9360 8514 – just ask for Steven.